4 Ca Gray Whales3 N. Elephant Seals-probably juveniles since adults are at sea this time of year(Dr. Jan Hodder).Saw 2 cases of suckling by Stellar Sea Lions-SEA national volunteers saw these actions first.Large numbers of harbor seals,Ca sea lions,and stellar sea lions.Herman's gulls(observed trying to take fish from the brown pelicans),brown pelicans,turkey vultures,and cormorants were obvious. Vandalism occured at the point that has the south bench in this mile. Someone pulled it out of the ground and threw the pieces over the bluff (they are visible on the beach below). The mile had a good summer. Tree cone production was plentiful, and parts of the trail had good moisture content. The kelp forests were thick. This summer there were usually 4-6 summer Gray Whales in the area. The large numbers of Ca. Sea Lions indicates that the males have returned from the breeding areas. The 3 N. Elephant Seals although not totally unexpected are a rare sight this time of year. The suckling by the Steller Sea Lions was totally unexpected, esp. since one was much larger than you would expect. 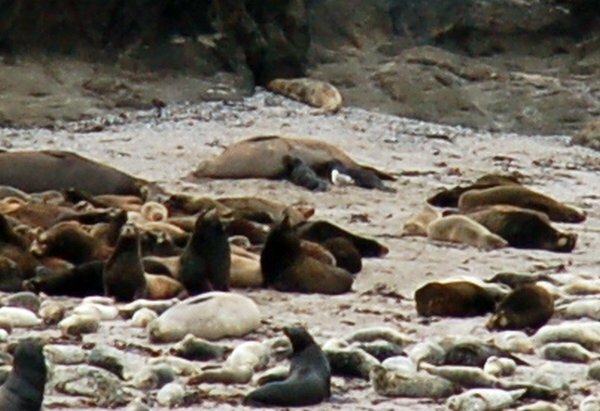 The one dead Ca.Sea Lion was being pecked at by gulls. There were large numbers of Harbor Seals. Hermann's Gulls with Brown Pelicans, Turkey Vultures and Cormorants were observed. In general, wildlife numbers were good.Did not see any signs of the lilies in the restoration sites-too late in the summer. The areas had been burned in the spring. Except for the vandalism of the bench, the area was in good condition-very little litter, erosion, and the people that I observed and worked w/ were enjoying a great day and the wildlife. Heavy Human impact (32)- 27 viewing wildlife, 3 taking photos and 2 fishing.